Will Today’s U.S.-Armed Ally Be Tomorrow’s Enemy? Lessons from the long war and a blowback world. Is it too early—or already too late—to begin drawing lessons from “the Long War”? That phrase, coined in 2002 and, by 2005, being championed by Centcom Commander General John Abizaid, was meant to be a catchier name for George W. Bush’s “Global War on Terror.” That was back in the days when inside-the-Beltway types were still dreaming about a global Pax Americana and its domestic partner, a Pax Republicana, and imagining that both, once firmly established, might last forever. “The Long War” merely exchanged the shock-‘n’-awe geographical breadth of the President Bush’s chosen moniker (“global”) for a shock-‘n’-awe time span. Our all-out, no-holds-barred struggle against evil-doers would be nothing short of generational as well as planetary. From Abizaid’s point of view, perhaps a little in-office surgical operation on the nomenclature of Bush’s war was, in any case, in order at a time when the Iraq War was going disastrously badly and the Afghan one was starting to look more than a little peaked as well. It was like saying: Forget that “mission accomplished” sprint to victory in 2003 and keep your eyes on the prize. We’re in it for the long slog. When Bush officials and Pentagon brass used “the long war”—a phrase that never gained much traction outside administration circles and admiring think tanks—they were (being Americans) predicting the future, not commenting on the past. In their view, the fight against the Islamist terrorists and assorted bad guys who wanted to get their hands on weapons of mass destruction and truly bloody the American nose would be decades long. And of that past? In the American tradition, they were Fordian (as in Henry) in their contempt for most history. If it didn’t involve Winston Churchill, or the U.S. occupying Germany or Japan successfully after World War II, or thrashing the Soviet Union in the Cold War, it was largely discardable bunk. And who cared, since we had arrived at a moment of destiny when the greatest country in the world had at its beck and call the greatest, most technologically advanced military of all time. That was what mattered, and the future—momentary pratfalls aside—would surely be ours, as long as we Americans were willing to buckle down and fund an eternal fight for it. An even more reasonable date, however, might be July 3, 1979, when, at the behest of national security advisor Zbigniew Brzezinski, President Jimmy Carter signed “the first directive for secret aid to the opponents of the pro-Soviet regime in Kabul.” In other words, six months before the actual Soviet invasion of Afghanistan began, the U.S. threw its support to the mujahideen, the Afghan anti-Soviet fundamentalist jihadists. What followed was the creation of a Rapid Deployment Joint Task Force, meant in a crisis to get thousands of U.S. troops to the Gulf region quickly. In the Reagan years, that force was transformed into the Central Command (Centcom, of which General David Petraeus is now commander), while its area of responsibility grew as the U.S. built up a massive military infrastructure of bases, weaponry, ships, and airfields in the region. The future is, of course, unknown, but as our president and his foreign policy team prepare to make crucial decisions in the coming months about Afghanistan, Pakistan, Iran, and Iraq, shouldn’t our 30-years’ war across the oil heartlands of the planet, essentially one disaster-hailed-as-a-victory after another, offer some cautionary lessons for us? Shouldn’t it raise the odd red flag of warning? Let me suggest just one lesson that seems to be on no one else’s mind at a moment when a key “option” being offered in Washington—especially by Democrats not eager to see tens of thousands more U.S. troops heading Afghanistan-wards—is to arm and “train” ever more thousands of Afghans into a vast army and police security force for a government that hardly exists. Based on the last three decades in the region, don’t you think that we should pause and consider who exactly we may be arming and who exactly we may be supporting, and whether, given those 30 years of history, we have the slightest idea what we’re doing? In the Afghan branch of it, our fervent American jihad of the 1980s involved the CIA slipping happily into a crowded bed with the Saudis, the Pakistanis, and the most extreme Islamist fundamentalists among the anti-Soviet Afghan fighters. In those years, the Agency didn’t hesitate to organize car-bomb and even camel-bomb terror attacks on the Russian military (techniques endorsed by CIA Director William Casey). The partnership of these groups wasn’t surprising at the time, given that Casey, himself a Cold War fundamentalist and supporter of Opus Dei, believed that the anti-communism of the most extreme Islamist fundamentalists made them our natural allies in the region. With that in mind, in tandem with Saudi funders, the CIA provided money, arms, training, and support (as well as thousands of American-printed Korans). The funds and arms were all funneled through Pakistan’s Inter-Services Intelligence organization (ISI). At the time, our generosity even included offering Stinger missiles, the most advanced hand-held, ground-to-air weapon of the era, to our favored Afghans. The CIA also came to favor the most extreme of the jihadists, particularly two figures: Gulbuddin Hekmatyar and Jalaluddin Haqqani. Now, leap forward a couple decades. In that same country, who exactly is the U.S. military fighting? As it happens, the answer is: the forces of the old Taliban, rejuvenated by an American occupation, as well as its two key allies, the warlords Gulbuddin Hekmatyar and Jalaluddin Haqqani, who are now our sworn enemies. And we are, of course, pouring more billions of dollars, weaponry, and significant blood into defeating them. In the process, with hardly a second thought, the Obama administration is attempting to massively bulk up a weak Afghan army and thoroughly corrupt police force. The staggering ultimate figure for the future combined Afghan security forces now regularly cited in Washington: 400,000. In other words, 30 years after we launched our jihad against the Soviets by arming the Afghans, we are now fighting almost all the people we once armed and arming a whole new crew. All sides in the debate in Washington find this perfectly sensible. Then, of course, no one should forget al-Qaeda itself, which emerged from the same anti-Soviet struggle in Afghanistan in the late 1980s—Osama bin Laden first arrived there to fight and fund in 1982—part of the nexus of Islamist forces on which the U.S. bet at the time. In other words, when it came to Iraq, we were for weapons of mass destruction before we were against them. Of course, you know the story from there. 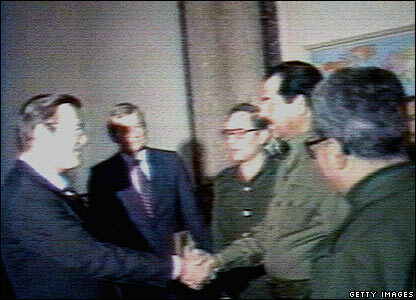 Next thing, Saddam Hussein had transmogrified into a new Adolf Hitler, and after his next invasion (of Kuwait), Gulf War I commenced—another smashing American “victory” in the region that only led to ever more war and greater disaster. A decade of regular U.S. air attacks on Saddam’s various military facilities and defenses ensued before, in March 2003, the Bush administration launched an invasion to “liberate” his country and its oppressed Shiite and Kurdish populations. Soon after, Washington’s viceroy in occupied Baghdad would demobilize what was left of Saddam’s largely Sunni-officered 400,000-man army. (According to Bush administration plans, liberated Iraq was to have only a lightly armed, 40,000-man border-patrolling military and no air force to speak of.) Soon, however, the U.S. found itself in yet another war, a bitter, bloody Sunni Party insurgency amid a developing sectarian civil war. Once again, we chose a side and, after some hesitation, began rebuilding the Iraqi military and its intelligence services, as well as the country’s paramilitary police force. The result: a largely Shiite-officered army for the new government we set up in Baghdad, which we proceeded to arm to the teeth. Now, Iraq has a U.S.-created army of approximately 262,000 men, and the interior ministry, which oversees the police, employs another 480,000 people. This is, of course, a gigantic security infrastructure, and not even counted are an estimated 94,000 members of the Sunni Awakening, mostly former insurgents and erstwhile opponents of the army and police that the U.S. paid and armed to make the “surge” of 2007 a relative success. The Iraqi government has recently purchased 140 Abrams tanks from the U.S. through the Foreign Military Sales Program and, as soon as the price of oil rises and it feels less financially strapped, it’s eager to buy F-16s for its still barely existent air force. We now tend to think of blowback as something in our past, something that ended with the attacks of 9/11. But in the Greater Middle East, one lesson seems clear enough: for 30 years we’ve been deeply involved in creating, financing, and sometimes arming a blowback world. There’s no reason to believe that, with the arrival of Barack Obama, history has somehow been suspended, that now, finally, it’s all going to work out.